SKU: V15. Category: Videos. Tag: Prenatal Development. 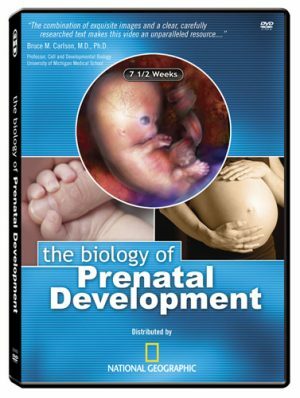 The Biology of Prenatal Development presents human prenatal development throughout all 38 weeks of pregnancy, emphasizing the first eight weeks (the embryonic period) when all body systems and more than 90 percent of body parts emerge and begin to function. This award-winning science documentary features rare imagery of the living human embryo and fetus, while growing inside the womb. Produced in conjunction with and endorsed by human development experts, this DVD combines facts gleaned from the medical literature with images produced from six different imaging technologies. This visually compelling program is intended for general audiences and may be shown in public settings (but not broadcast or shown in theaters). It communicates an unparalleled visual appreciation of early human development.